‘Honeybee population decline is a worldwide important issue,’ says Anita Jemec Kokalj from the University of Ljubljana, who worked on the study. Recently, pesticides have taken the blame for this decline and EU regulations on neonicotinoid-based insecticides look set to tighten. Cerium oxide nanoparticles, however, may also be harming bees and scientists have already found that they induce biochemical changes in other insects.2 Cerium oxide nanoparticles are ‘widely used as a fuel catalyst and it also has many other applications. Therefore, it can be deposited on plants and come into contact with pollinators,’ explains Jemec Kokalj. The biochemistry of honeybees born in summer is quite different from those born in autumn. Worker honeybees tend to live for only 40 days in the summer months, but autumn bees usually stay in the hive and live through until the next spring because they don’t raise any young over the winter. This means that winter bees have slower metabolisms, while summer bees have different levels of enzyme activity to promote learning, which is important for foraging. 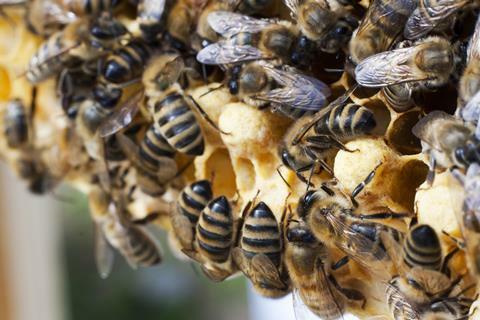 The Slovenian team fed worker honeybees collected in both summer and winter with sucrose solutions spiked with cerium oxide nanoparticles and measured the activity of two enzymes after nine days of chronic exposure. The bees did not die from eating cerium oxide nanoparticles, but summer bees that received a 250mg/l dose of the nanoparticles became visibly hyperactive and agitated. The team observed a general increase in activity of one of the enzymes, acetylcholinesterase, which is involved in honeybee learning. This indicated that the central nervous system of the bees was affected. They also observed an increase in the activity of an enzyme associated with pollutant removal. Bees collected in the summer months were significantly more affected than those collected over autumn. However, accurately measuring ecological concentrations of cerium oxide nanoparticles is challenging. Ryszard Maleszka, an expert in how diet affects bee behaviour from the Australian National University, points out that in general ‘chronic lab testing … is not necessarily representative of environmental exposure’. ‘Nonlethal yet toxic responses at [low] dose are of significant concern … additional mechanistic studies that include non-nanoparticle controls should be undertaken,’ adds White.